This week, I spent $86.95, for a monthly grand total of $404.71 for August. Even though I’m a tad over this month, I’m quite pleased. There was $50 in entertaining expense, so taking that into consideration, my budgeting was excellent! Plus, I spent $30 for 50 lbs of tomatoes. Yes, even though I’m growing loads of tomatoes, I truly don’t think there is ever enough! I’m canning, oven-drying (dehydrating), and freezing (raw & cooked); I still think that I’ll have to eventually purchase commercially canned tomatoes but I’m hopeful I can hold off for many months! 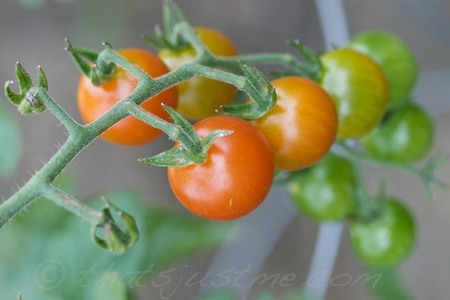 My garden will never produce as many tomatoes as I’d like…even though I’m getting full bowlfuls every couple of days, it is never enough! Tomatoes are the perfect food. I adore them! I’d love to someday grow enough tomatoes so I’d never have to purchase another can/carton of commercial tomatoes again, but that is not a reality this year, but I’m trying to make the best of what I have. 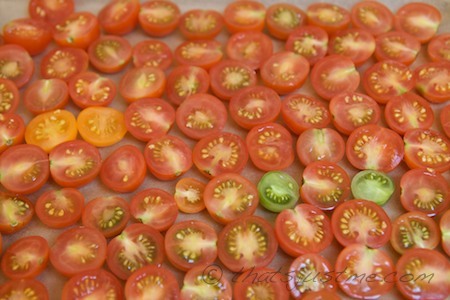 So, I have been learning about the many ways to preserve fresh garden produce for consumption in colder months. I’ve made a lot of tomato sauce, sometimes with eggplant and peppers. I’m slow-cooking in the oven or in my crock pot. Then storing in freezer bags in my freezer. I tried something new the other day and I think it’s going to be a favorite. I was watching the Dehydration class over at breadbeckers.com and it inspired me to learn more about dehydration in the oven. I was thrilled to find out that my oven offers very low temperatures, as low as 100° so I experimented with a batch of cherry tomatoes. It took over 24 hours, experimenting with different temperatures (135-150°) depending on the time of day – it’s helpful if you use an oven thermometer to make sure oven temps aren’t off. 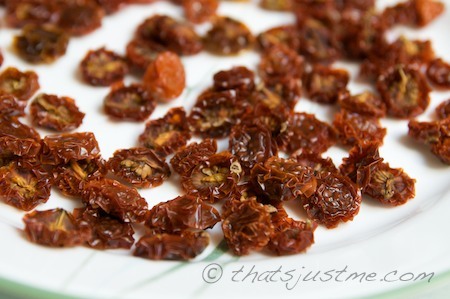 The tomatoes dried to little jewels of sugary-flavorful-goodness! 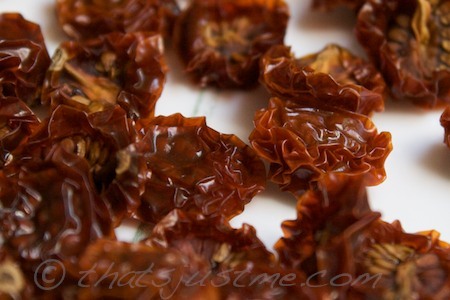 Then I spread them on a large plate, and flash-froze them, then bagged them in a quart freezer bag for freezer storage. I know it could be possible to maybe store in a jar, or in olive oil, but I figure that the freezer would be the safest method for now. I finished drying a second batch yesterday morning, and they went into the freezer as well. Next, I’m going to try some good ole fashioned canning! I haven’t decided if I’ll do a raw-pack or maybe stewed. I suppose I could try both! 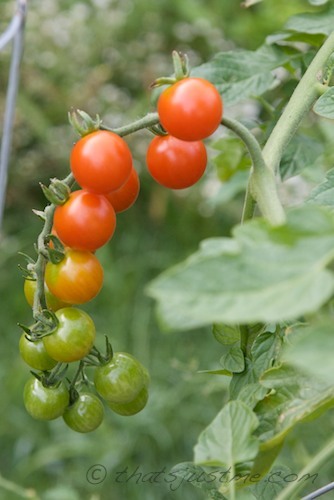 I know I will not have enough of my own tomatoes, so I might be buying some “seconds” tomatoes at the local farm. One farm is selling 7 lbs for $5.99 while supplies last. I’ve been pouring over canning cookbooks for the last week or so, trying to learn all I can (haha, no pun intended) and I hope that I love canning enough to keep doing it all year long. I have dreams of applesauce in the fall, and orange jam in the winter. This week, I spent $99.50, with a monthly total of $317.76. That leaves $82.24 for the rest of August. I was a little lazy this week regarding dining out. Twice in one week, which is unusual for us; In reality, we actually spent $60 for dining out, but I offset a portion of the expense with some extra cash we received, so my budget wasn’t affected too badly. The positive spin is we each had leftovers that I put in the freezer for next week when I’m feeling “lazy” again! I already have a case of regular pint jars from Amazon ($16), but picked up 3 more cases from the local True Value store: regular pints ($7), wide-mouth pints ($8) and regular quarts ($8) along with 2 cases of regular lids ($1.29ea) – great prices, and a lesson learned to wait for sales when buying canning jars and lids! The sales associate talked me into getting the wide mouth pints, stating I could return them at any time if I found that I didn’t need them. But they will be good to have on hand. I also am expecting the $20 Progressive International Canning Essentials Kit to arrive on Monday from Amazon. I decided to go with a higher quality canning kit, instead of one of the cheaper alternatives because the plastic looks more durable and heat-proof and the lifter seems a lot easier to use. I considered the Kuchenprofi 18/10 Stainless Steel Funnel but I wanted to make sure that canning wasn’t just a faze for me. It’s still in my shopping cart, so if I need to upgrade, I’ll buy it later. Tuesday: Dining out – AGAIN! But the good thing is we each have a meal of leftovers stored in the freezer. I was just reading the article over at Cornucopia about big food companies hiding behind the seemingly little organic food companies, while donating hundreds of thousands (and millions) to shut down Prop 37 in California, which would require all food labels to list if the ingredients are GMO (genetically modified). So, as I’m reading, I’m shocked to learn that Dr Mercola from DrMercola.com donated a whopping $800,000.00 in favor of the new law. How much money does this swindling health-nut actually make, that he’s able to give almost a million away to the cause! It’s sad that he’s been profiting THAT much while taking advantage of so many vulnerable people. I hope that Dr Mercola’s contributions to Prop 37, does not give him any legitimacy; it would be a horrible circumstance if he profits more from this exposure. Or maybe that is what he’s looking for! Hmm. But on the other hand, I hope his association with Prop 37 doesn’t disgrace the blessing that this law could bring us. After all, if GMO labeling is required in California, then every other state would benefit! This week, I spent $68.76, with a monthly total of $218.26. That leaves $181.74 for the rest of August. I’m excited that our vegetable garden is really working. Crazy amounts of eggplant and tomatoes, with fresh oregano, basil, and an occasional jalapeno pepper make a great slow-baked sauce to freeze for consumption during colder months! Pickling cukes are yummy for my lunch and for homemade pickles! I’ve picked a couple of my red cabbages too. Next year, I will try to weigh all my harvests, but for now I’m taking photos, for keeping track, but I have no doubt that my garden is helping us save a ton on our budget! For one example, I’ve been checking prices, and a 1/2 pint of sungold tomatoes are selling for $5 at the local farm store. I’ve been harvesting at least 1/2 pint+ every other day! What a savings! That’s not even including the red cherry tomatoes or my large beefy tomatoes! This week, I spent $149.50. That leaves $250.50 for the rest of August. The first week is always a bit higher. I needed some basic pantry items from iHerb.com. Love that store!!! We also hosted a big pot luck party for DH’s previous co-workers. Fun! I have high hopes that it’ll be a good budgeting month. My veggie garden is starting to REALLY payoff, I feel so sustainable! hehee Between the tomatoes, pickling cukes, beets, and eggplant, I yielded my first red cabbage! Exciting! I hope I can keep growing well into the cooler months! This week, I spent $37.42, ending the month with a grand total of $417.39. I won’t squawk about the extra $17.39 I spent! My week (on Thurs) started with very good intentions, and then DH told me the farm was out of jumbo eggs. Sooo instead of replanning, I caved & my budget of $20 was blown to smithereens with a $17 take out purchase! But I recovered by using a local farm store’s Groupon coupon that I was saving for August! Whoo hoo! $30 in groceries for only $15.29. And then Saturday, we splurged on two Friendly’s 3-scoop sundaes. I had a BOGO coupon that I couldn’t resist using! Hey, it was only $5 for both, so bargain! Wilson Farm (large local farm store) $15.29: pint of local blueberries, local summer squash, local spring onions, NJ (not organic) peaches, local green beans, dozen local corn, local scallions, (2) dozen jumbo local eggs, bananas, and local half & half – used my $30 groupon!